When Derek and I got married it was the middle of the summer. We spent most of that summer traveling for our honeymoon, and then to Idaho for our reception, then to Oregon for my brother-in-law's wedding, then back to Idaho for me to run a half marathon, and then finally we started getting settled into our new married life. By the time we got settled it was September, and then the birth of Pinterest happened, and all of a sudden I had to make pumpkin EVERYTHING. I made pancakes, muffins, ice cream, bread, brownies, cookies... basically if there was a way to put pumpkin into something, I did it. Derek was scarred and traumatized and to this day, he hates all things pumpkin. Except these cupcakes. Four years later these are the only pumpkin things I make during the fall now, and Derek will gladly eat 1-2 of them. He will however lose his marbles if he sees anything else with pumpkin in it the rest of the year. If that happens, I'll be sure to post about it on Instagram. 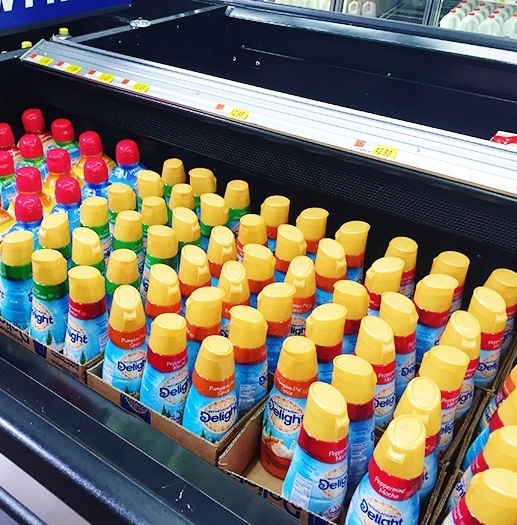 When we were shopping at Walmart this weekend I noticed that all the delicious holiday flavored coffee creamers were out. We don't drink coffee in our house (but I'm sure it would be great in a morning cup of Joe! ), but I thought it would be fun to replace the milk in this recipe with the Pumpkin Spice International Delight Coffee Creamer, and it certainly didn't disappoint. They have a bunch of other holiday flavors too that I can't wait to try in other recipes throughout the holidays. You can check to see if your store is participating in the in-store demos here. Preheat the oven to 350 degrees F. Grease the top of a standard 12-cup muffin pan (in case you get some “muffin top” action). Line pan with 12 baking liners. Sift the flour, spices, baking powder, baking soda, and salt into a medium bowl; set aside. In a separate bowl, whisk to combine pumpkin, milk, and vanilla; set aside also. Using an electric mixer on medium-high, cream butter and sugar together until light in color and fluffy. Turn mixer down to low, and add egg and yolk. Beat well to combine. Next, add 1/3 the flour mixture, then 1/2 the pumpkin mixture, another 1/3 of the flour mixture, the remaining pumpkin mixture, and the last 1/3 of the flour mixture, mixing to combine after each addition. Fill baking liners about 3/4 full (I always use my large cookie scoop for this). If you've filled all 12 baking liners and still have more batter, you can fill standalone baking cups 1/2 full with batter. Bake 25-27 minutes OR until a toothpick inserted in the middle comes out clean. Cool 3 minutes in pan, then remove from pans to wire racks to finish cooling completely. Whip all the ingredients together with an electric mixer until light and fluffy. add more milk/powdered sugar until you reach the desired consistency! We don't drink coffee either (obvi) but those creamers in hot chocolate give me all the heart eyes. This post makes me excited for fall! These look so delicious. I'm so glad pumpkin season is upon us! Every time I read your blog, I get so hungry! lol. This looks delicious! Devin is a huge fan of pumpkin anything and I'm always like...meh. These look really awesome though!